Fedora Media Writer has been significantly improved and is now the official, tested and supported way to make bootable media. Fedora Media Writer supports Linux, Mac, and Windows. 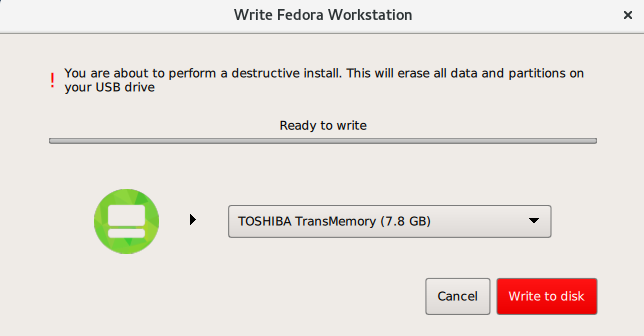 It is an easy way to make bootable USB media to install Fedora (or other operating systems). Using Fedora Media Writer is strongly encouraged, although other USB media creation software can work as well. 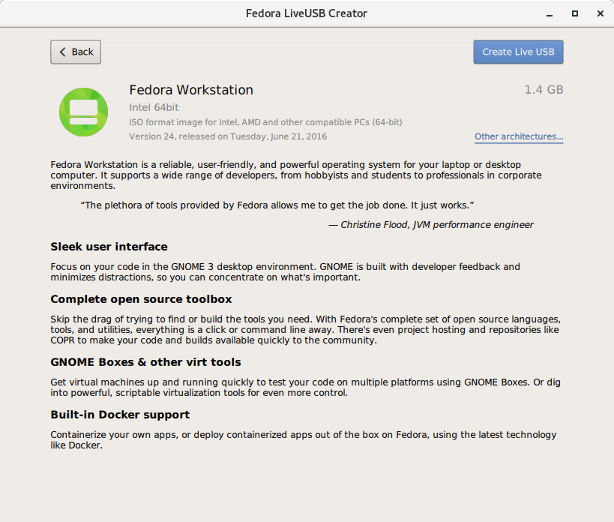 Some of the new additions to Fedora Media Writer are that Fedora Workstation and Server are easily and quickly accessible from the selection on the main screen. Further choices are available if you select the button below Custom OS. This offers a selection of various Fedora Spins, such as XFCE or Mate. Historically, universal USB creation tools, such as Unetbootin, are a popular way to create USB installers from ISOs intended for optical media. They typically create a filesystem on the USB drive by extracting files from the image, and writing syslinux bootloader to the device. These methods circumvent the boot-loader configuration built into Fedora images, which are pre-partitioned and designed to boot on UEFI systems with SecureBoot enabled as well as BIOS systems, and thus they do not produce consistent results with Fedora images, especially on UEFI systems. The best results are produced by utilities that use a direct write method and do not modify the Fedora image. Always think twice before writing an image to the device. The media creation methods described in this article are destructive. All data on the USB stick are deleted during the process, so make sure you have a back up of the data on the USB stick. Double check that you have selected correct device to write the image to! On Fedora 25 or later, Fedora Media Writer is available in the default repository. You can use dnf to install the package. or in Gnome 3 select Activities, then select Utilities, and then click on Fedora Media Writer. The best way to install Fedora Media Writer on various Linux distributions is to use the pre-built Flatpak package. The package can be obtained from the official Flatpak repository Flathub.org. To setup Flatpak on your Linux system, follow the guidelines on the Flatpak documentation page. Download the latest Windows Installer file from GetFedora.org. The server automatically detects the running system and offers you the correct installation file for your Windows version. Run the installation by double clicking the installer, and then continue through the set-up wizard. The Wizard lets you customize the software’s installation if you choose to. Run the application by clicking on a launcher. In Windows 8 and 10, the Fedora Media Writer launcher will be placed in the All apps menu under F. In Windows 10, you can just type Fedora Media Writer in the search box on the task bar. Download the latest Macintosh Disk Image (the package will have a .dmg extension) from GetFedora.org. The server automatically detects the running system and offers a correct package for your MacOS. 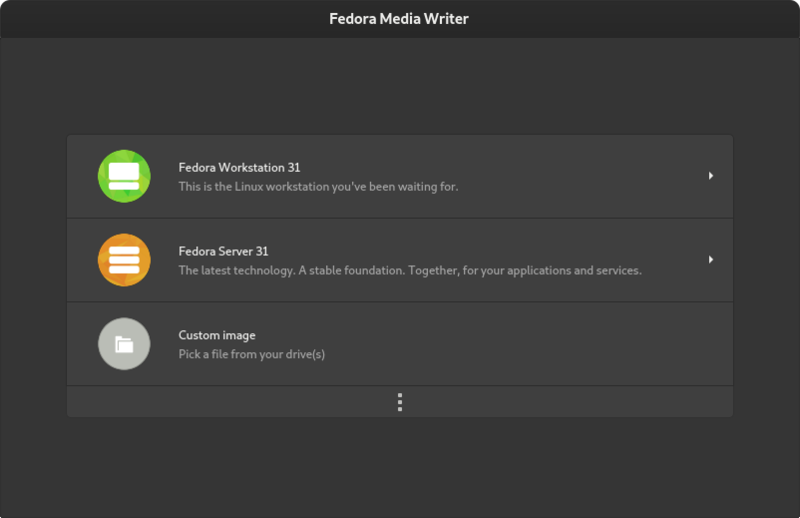 Navigate to your applications directory, and then launch the Fedora Media Writer application. Select "Open" to run the program, when MacOS will ask you to confirm the action. Writing the ISO image to the USB Media. The main selection lets you choose one of the default Fedora editions, Fedora Workstation or Server. Fedora Media Writer displays more details about the edition before you can proceed with downloading the image and the USB creation. You can choose a different architecture, if you select Other variants. Select "Create Live USB" to proceed. Fedora Media Writer will automatically download the ISO for you. If you have downloaded the ISO before and placed it in the Downloads directory, it will be immediately available to use. Plug in a USB drive on which you want to create the bootable media. To write the image onto the media, click the red Write to disk button. 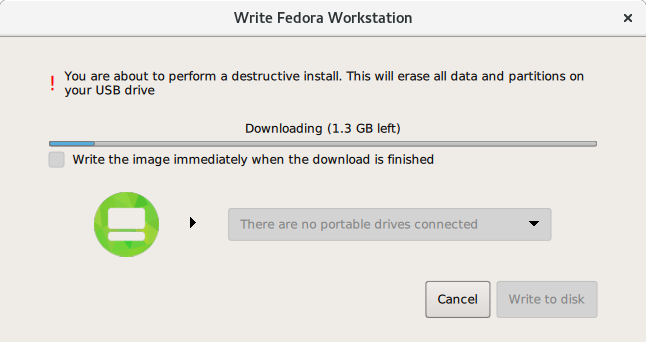 Using the Fedora Media Writer is highly recommended for everybody, because it offers a reliable way to create a live USB stick for Fedora installation. However, some experienced users may prefer to go through the creation process manually. If you decide to do so, you have to download the installation images and use an application to write them onto the USB stick. If you have downloaded and verified the installation images manually, you still can write them onto the USB stick using Fedora Media Writer. You can also choose a Fedora Spin featuring favorite alternative desktops or tools for specialized tasks at https://spins.fedoraproject.org. Use the dd utility to write the image. Pay extreme attention to the source (if=) and target (of=) device. The dd command destroys all data on the target device. If you made a mistake, you could lose important data.